Saints Row is the video game series many of us think of, with good reason, as the premiere Grand Theft Auto imitator. In theory, we won't think of the next Saints Row that way. "All I can tell you is that [pause] it's all good," Danny Bilson the head of "core" games at Saints Row publisher THQ told Kotaku today in New York when we pressed him for details on Saints Row 3. But that wasn't really all he could tell us. We wanted to know if Saints Row should still be thought of as a wild Grand Theft Auto, so he gave us a little more about what the series is and will be. "In my mind its incredibly outrageous and will have less and less relationship with Grand Theft Auto." Details? Not yet, not from Bilson. "A secret weapon isn't a secret weapon if I blow the secret," he said. 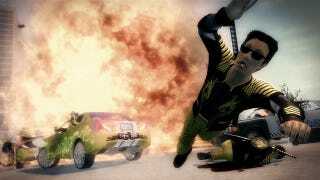 THQ has publicly promised Saints Row 3 for the fall, but we haven't seen it yet.